Summary: Peter and Olivia recover after Etta’s untimely death in very different ways. It’s a safe bet no other show this season will have you angrily screaming “NO!” at the television as much as this episode. Peter and Olivia are distraught over Etta’s death. 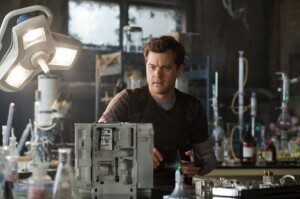 Peter goes through some of her items, and he discovers a hidden compartment full of weapons that Etta left. Meanwhile in Manhattan, the Observers transport large covered cargo through a wormhole in the city. Astrid messages the team and lets them know it will take longer to get to the next tapes out of the amber, because they’re too close to a propane tank and bottle of ethanol. Etta’s phone rings, and Anil is on the other end; he got word of Etta’s death, and wants the team to help him investigate the Observers’ new shipment. They arrive in Manhattan, and Anil tells them that they have captured an Observer, his book, and cube device. Based on the markings left on the charred ground, Peter deduces the cube might be a way of opening the portal. He becomes intent on figuring out how to make that device work so he can use it to destroy the portals. Peter starts working on the cube and realizes how much power is coming out of it. Meanwhile, Astrid works on decoding what she believes is a shipping manifest from the Observers, but needs more computing power to do it. Walter has the idea to collapse the wormhole on the Observers’ end to create a black hole on their side, and Peter has an anti-matter grenade from Etta that would do just the trick. However, they’d still need to know the time the Observers are going to get another shipment, as well as how to use the cube. 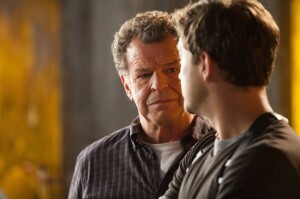 Peter decides to interrogate the Observer that’s captive; he doesn’t trust Walter’s plan that Etta died for anymore, even though Olivia is afraid of his increasingly reckless attitude. Anil tells Peter that antifreeze keeps the Observer tethered, and all his abilities are augmented by tech in his head, not biology. Anil wakes up the Observer, and Peter begins his interrogation. He keeps track of the Observer’s eye movements as he puts pieces of the device together, following his pupil dilatation to figure out if he’s getting nervous or not. Walter finds a tape in his desk of one of Etta’s birthdays, but Olivia refuses to watch it. Walter tells her about his experience losing his family, and how he’s aware that she’s afraid she and Peter will lose each other again, but she still can’t watch it. Astrid decodes the book, and they learn that the next shipment is that afternoon. Olivia notifies Peter of the shipping time, and Peter believes he’s gotten the device started. They arrive where the shipment will take place, and after a brief tussle with an Observer, they manage to open a wormhole and fire an anti-matter grenade in, collapsing the wormhole. However, as they leave, they notice another wormhole with cargo coming out—how could they recover so quickly if it was turned into a black hole? Peter storms off to get answers, whilecOlivia suddenly sees a poster from the resistance: it has Etta’s photo and says RESIST, to match the Observers’ OBEY posters. As Olivia finally watches Etta’s birthday tape, Peter cuts into the Observer’s head and removes a piece of tech from his brain, killing him. Olivia calls Peter, asking him to come home, but Peter sticks the Observer tech into the back of his neck, and it implants itself in his brainstem. Okay, seriously. How about that ending? Peter’s obviously holding the idiot ball here; we all know it’s going to backfire badly. So on one hand, it’s hard to really root for him. He cut a hole in the back of his neck and stuck a foreign device from the future into his spine. Absolutely none of that sounds like a good idea, and it’s impossible to get around that. It’s very, very hard to not count that as a flaw. What’s worth commending, though, is how delicately all of this was set up. Peter noted last week how the Observers are always one step ahead of them, and they have been. They needed to find another strategy. And on a normal day, taking a piece of tech out of an Observer’s head and transplanting it into his own wouldn’t have been something Peter would do, but this is the least normal day he’ll have. Etta’s death has, unsurprisingly, made him snap. So, unbelievable as it is that anyone could be this dumb, it’s sadly believable in this case of utmost desperation. 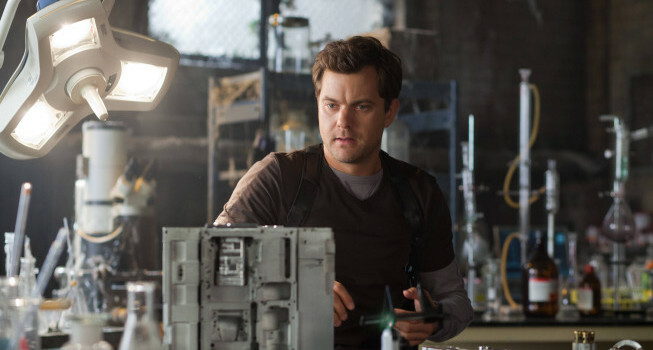 Joshua Jackson was stellar in his performance throughout this hour, really selling an armor-piercing stare that never waned. And considering how Peter’s practically thrown Olivia and Walter by the wayside, it’s clear that he’s forced a “nothing to lose” mentality onto himself despite actually having things to lose. Olivia might have been mostly reactive this week, but that doesn’t mean she wasn’t put through the emotional wringer. Admittedly, the quiet depression and loneliness Olivia was going through wasn’t exactly the most engaging to watch, but it is important and necessary. Anna Torv seemed to revert to the purposefully-wooden kind of performance she had back in the early days of the show, shrugging off emotions for the sake of the job. It makes sense here, and it also makes the few times she breaks out of her wall when reacting to Peter stand out even more. Olivia’s always put walls up, so her depression has simply solidified them harder, just as Peter’s daringness has been kicked into overdrive. We aren’t really learning anything new about them, but we’re getting some final strokes on their character arcs in this last season that work with what we’ve been given. Torv particularly shined when Olivia called Peter after watching Etta’s tape. The knife was twisted even further, though, when Peter all-but hung up on her as the tech kicked in. This is something else set up from the beginning of the season: Peter and Olivia’s lack of stability in their relationship. Any emotional crisis causes them to immediately split apart now, probably thanks to all the times in the past these crazy crises did tear them apart. After all, when your girlfriend gets replaced with a nefarious double and your boyfriend blinks out of existence, you might be a little paranoid of feeling the same kind of loss again. They’re so fearful of being hurt that they cause themselves to lose each other all over again. It’s tragic, but it’s a good final note to play for the last season. Their love is important, as we’ve been told time and time again, so it seems for the next few episodes the task will involve getting their love back after Peter’s decision inevitably comes back to bite him. Though this wasn’t Walter’s episode, John Noble still pulled off some strong moments as the increasingly exhausted Walter. Having Walter and Olivia connect over Etta’s death was quite beautiful, and resulted in what’s become a rare Walter/Olivia scene. His line about dealing with loss by “putting walls around your heart, or breaking the universe, or seeking vengeance” was a brilliant way to bring the show full circle thematically, and it was wonderful to see the two bonding. The other theme this week that was a bit downplayed was the importance of being remembered. How Etta can be remembered is brought up a number of times. Peter makes it plenty clear to the Observer that Etta will be remembered more than any one Observer, a great comment on the flaws of a “legion” mentality. The most touching comment on legacy is when Walter tells Olivia that “your pain is her legacy” because it proves Etta was alive. But it’s sold the best when Etta becomes the face of the Resistance. Sure, those RESIST posters are a little cheesy, but it’s a great parallel to the OBEY posters that Olivia conspicuously noticed all throughout the episode, and will be a nice blip of hope the team needs now. I’m starting to hope Etta doesn’t come back in any form, because this is a very cool way to keep her spirit alive in the show. The cinematography in this episode was particularly beautiful, so props to P.J. Pesce for strong direction. The circling shot when Peter was suffocating the Observer was discomforting, while Olivia’s reflection in the TV as she watched Etta’s tape was downright beautiful. The script by J.H. Wyman was very strong, too, with numerous bits of foreshadowing and payoffs throughout (like the aforementioned posters.) The “ants under our shoe” line and then having Peter quite literally about to be stepped on by an Observer’s shoe was also very clever. What results is an impeccably strong, emotion-driven episode, which is exactly what the show needed after last week’s chaos. This wasn’t necessarily a catharsis, but considering the high level of pay-off we’ve gotten so far, I’m looking forward to seeing where the things being set up here ultimately lead. The title of this episode should have been, “Peter, What Are You Doing? !” Because I said that more times than I can count. Seriously, though, what was the titular “Origin Story” here? Initially, I thought this was going to be a 2015 flashback episode, but it seems the origin that’s being told is either of this new Etta-driven movement in the resistance, the new Observer-Peter, or both. Or maybe it’s something we aren’t aware of, yet? It’s somewhat disappointing that Astrid’s back to being relegated to hanging out in the lab by herself for the most part, after getting a taste of her being in the action. But at least she’s still relevant, I guess. Now that Walter has Etta’s bullet, I’m wondering if calling it “the bullet that saved the world” doubles as foreshadowing, and he might somehow use it again to save the world this time. Just want to point out again that Walter was recording home movies on Betamax tapes in 2015. I like that Peter mentioned his ability to read people, referencing his con man days that are quite far gone now.